I'm kind of new here and I'm full of questions about historical equipment and historical orders of knighthood. I was very interested in the history of Order of the Garter, but I found no artistic evidence beyond conventional pictures of the founder knights, but I wonder how the order operated. 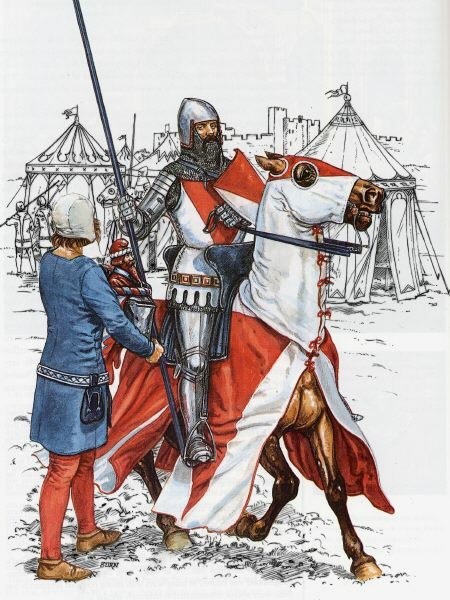 If the image below has historical accuracy and if they (the knights of the garter) ever participated in important battles , how they dressed in the fourteenth to the sixteenth centuries? You're mistaken if you think that the Order of the Garter was an order of warrior monks in the same sense as the Teutonic knights, because it wasn't. I'm not mistaken, they were a company noblemen and knights, but I didn't find any reference about war garment. Even if they had any group routine or if it was more a "enthusiastic society" than an Order. I became interested when I find out some portuguese soldiers and French knights who joined the Order, but they kept some tie or military duty? Tim was correct the Knights of the Garter were and are not a battlefield order. They did not fight as a group or have a distinctive uniform. They could encircle their own coat of arms with the Garter symbol and were entitled to use heraldic supporters in their coats of arms. Other than these distinctions they would be arrayed for battle in exactly the same way as any other important and wealthy individual. They were high ranking individuals and would likely to be commanding their own men at arms and knights in any battle. Richard was actually well thought of by a lot of the lower class but during turbulent times. His grandfather, Edward III, had established the Order of the Garter. Some of the figures of the noble's rebellion were knights of the order. Not long before that, Wat Tyler had been a figurehead of the peasants revolt. Upon reaching London, Wat Tyler was killed and everyone pretty much went home and resumed business. You may have come across sites listing both with both the past and present Templars and Masonry. However, going back in Templar history, the Templars in England had been treated well when the Pope and France broke up the main body of the Knights Templar. Few in England were punished aside from loss of social status and fines. Most were absorbed into the Knights Hospitaller. As an aside, Edward and his grandson had both bought their tickets into the Linen Armourers. That is a very contracted version of the 1380s and leading up to that in England, and a couple of events worth noting. Rhicard II was deposed and later said to have been murdered during the accession to the throne by Henry IV. There is a lot of history and politics one must understand before even bothering with modern conspiracy sites offering bad history and speculation. A complete list of those knighted can be found here. What they wore depends on the timeline and if at war would simply have had a surcoat supporting any heraldry they were associated with. A mantle of sorts worn for ceremonial use. The first picture appears to be Victorian or early 20th century, so I would not really trust it for historic accuracy. As has been mentioned, the Order was not a wartime thing; it was for various elites to pal about with the King at fancy dinners and what not. Perhaps a knight may have worn a garter over his leg in combat, but more likely it was kept in a civilian context. Effigies do occasionally show knights wearing garters over armour such as the Black Prince's IIRC, but that could be considered 'dress uniform', not necessarily combat wear. Also it may have appeared on heraldry, but that's also a subject of debate (how common heraldry was on the battlefield, etc). Edward of Woodstock/the Black Prince, was knighted for his actions at Crecy while still a teen. Knights were "knighted" by the kings and queens. The more modern affectation (such as Elizabeth knighting all the Beatles) were done in appreciation) and acknowledgments of merit and national contribution. The ornament of the garter is not shown on personal coats of arms but often as badges. The illustration does show their mantles (which will have a badge). I don't know the date of the illustration but it is in fair accuracy of surcoats bearing the heladric information of the individuals. The incident in court true to history. Very much like the incident between Harry Percy (also of the order) and Henry IV happening soon after Henry had been installed. Note that the Order of the Garter still exists today in its original form and purpose -- that is, as a very posh social club. Then as now, it included some of the kingdom's foremost military officers and leaders, but the more martially-inclined members of the order didn't fight together in a single unit -- they're most likely to be found leading their own retinues or units. For the standards of a modern illustration, it's a reasonably accurate representation of a mid-to-late 14th-century knight. He could have been a Knight of the Garter, but the arms he would have worn (and thus the one shown in the picture) would have been his own, not the Garter's. Tim was correct the Knights of the Garter were and are not a battlefield order. They did not fight as a group or have a distinctive uniform. They could encircle their own coat of arms with the Garter symbol and were entitled to use heraldic supporters in their coats of arms. Effigies do occasionally show knights wearing garters over armour such as the Black Prince's IIRC, but that could be considered 'dress uniform', not necessarily combat wear..
Like a purple mantle? I have to say that I had a completely different idea of what the order was. It seems more fancy stuff made to increase the prestige of noblemen than a company with some gentlemanly involvement with the King of England. However, going back in Templar history, the Templars in England had been treated well when the Pope and France broke up the main body of the Knights Templar. Few in England were punished aside from loss of social status and fines. Most were absorbed into the Knights Hospitaller. As an aside, Edward and his grandson had both bought their tickets into the Linen Armourers. I never imagined that the Templars would be welcomed anywhere besides Portugal, where the king had desires to nationalize the Templars as he did with the Hospitallers and another one. It makes sense, since we are talking of France and England. What is the Linen Armourers? Some kind of prestigious blacksmiths in England? The guilds were as much trade and merchants as being a fraternity. Referring back briefly to the peasants revolt, part of the issue was trade from other countries with the Flemish in England being sought out to eradicate competition ( see the weavers). Here is but one book on the guilds and the linen armourers mentioned as merchants and a fraternity of which royalty played significant roles. (see particularly pages 28-29). Over the centuries, becoming listed as merchant tailors. The knight depicted in the image above is Sir John Chandos (as indicated by the coat of arms, argent, a pile gules; Sir john Chandos died without children, so this coat of arms has not been used since 1370*). He was an advisor to Edward the Black Prince and founding knight of the Order of the Garter; he was the 20th member (out of 26 founding members), and occupied stall S21 (S = South). 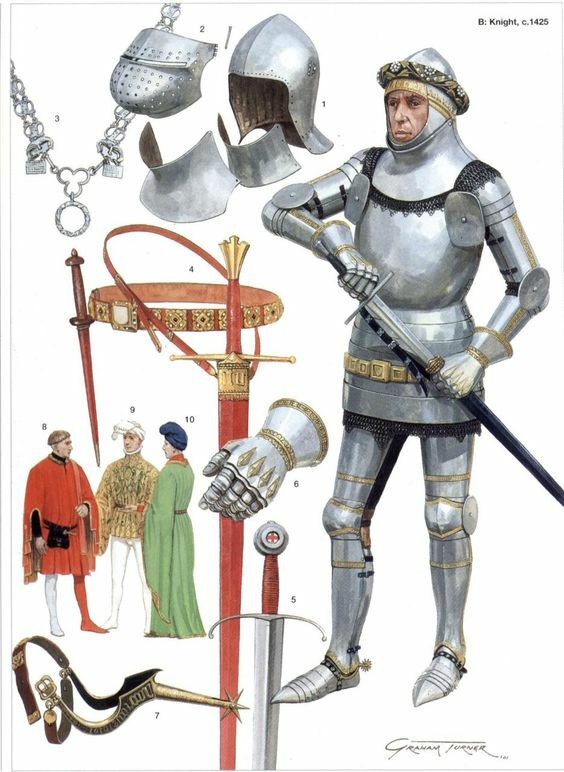 The armor and equipment would be appropriate for a late 14th century knight, but I kind of doubt that Chandos would have had plate armour for his upper arms, as that really did not become widespread in England or France until after his death in 1369/1370 (he was injured 31 December 1369 at the Battle of Lussac Bridge, and died of his wounds 1 January 1370). While on the subject of Chandos' death, it is worth mentioning that his death is partially attributed to his having slipped on a long robe or surcoat (you see this reflected in at least one Angus McBride depiction of Chandos). This was certainly not the prevailing trend at the time, and seems unlikely that such clothing would have been the result of his Order of the Garter connection (The Black Prince seems to have been a bit more fashion-conscious than that). In my research of Sir John Chandos, I have not found any record of any kind of uniform or common attire other than the standard purple garter for which the order was named. There are records of the Black Prince providing Chandos with armour and clothing -- such as a coat of plates covered in black velvet at the Eltham tournament on 31 December 1353, or robes and trimmings for a joust at Windsor on 24 June 1348 -- but I have not run across any record indicating Garter-specific cloths or items in those lists. It does seem that the garter was worn during feast days and other gatherings of the order, but I am unclear on whether that was required, or just a general trend. I think I recall coming across a reference to the Black Prince removing his garter before engaging in a joust, but I don't have that written down in my "Chandos Diary," and it really doesn't prove anything one way or another. * The current Chandos-Pole family is descended from Sir John's sister Alianore, whose daughter married Sir Peter de la Pole. Later (I believe in the 16th century), the de la Pole's re-appropriated the Chandos name, and now go by Chandos-Pole, but they retain use of the de la Pole coat of arms to the best of my knowledge. Hence my confidence in this being an attempt to depict one specific individual. P.S. Sir John Chandos' effigy was located in the Poitou region of France, but was destroyed during fighting in the 19th century (the info I have is no more specific than that). The French did replace the effigy with a monument to Chandos, but there is no surviving depiction of him, so I am not able to use that as a reference for info on his armor or clothing. P.P.S. The picture also has one other (nit-picky) detail that is most likely wrong. Sir John Chandos lost one eye in a hunting accident in 1359. We don't know which eye it was, but it was one of the factors in his death (lance from a French Squire through his blind-side eye, while he was slipping - as mentioned above). So, yeah . . . he probably shouldn't have two good eyes in that picture unless the armour is even more out of place. I noticed that he wore this adornment in his helmet, which I hadn't seen in all the statues of that time. At first I thought it was just a fifteenth century trend, but the Osprey's book "Henry V and the Conquest of France" mentions that it was actually a "garter" used by the Order of the Knights. This could be a proof of some kind of prop that distinguished members of the order from other people? The garter is the blue strap buckled around his left leg below the knee, not either of the decorations on his helmet (one of which is a border to the plates, imitating a coronet, the other an orle, a decorative survival of padding betwen an inner and outer helmet). All part of the rich adornment which affirms his status.